So at the #bloggersfestival on Saturday, I was lucky enough to have a mini makeover with Want Her Dress where they styled me with this beautiful camel coloured dress for a Barcelona date night, which I then actually wore it out for a date night out in Barcelona! From all the dresses to choose from and that I was styled in, I was particularly fond of this one and was even happier when they let me keep it! The sleeves are gorgeous: chiffon with slit sleeves pinched in at the middle, and the skater dress style is very me as it suits my body shape. 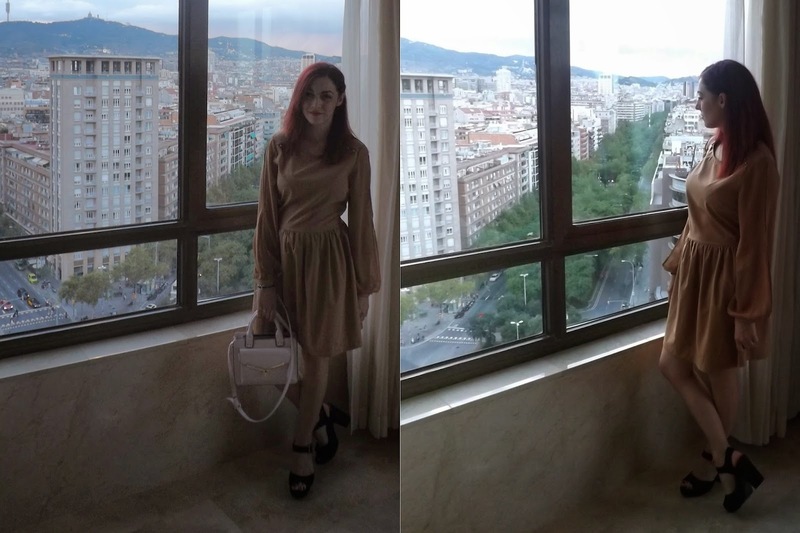 I styled it out in Barcelona with my chunky black heels and the only bag I had which was a little pink bag, but it looked good so I was happy with my final look. That night John enjoyed a walk along the beach front, enjoyed the old town's maze-like alleys and ate a yummy Chinese (lol - when in Spain). I think next time I'll be wearing this, will be here in the colder city of London, for yet another one of our many date nights, but styling it like I did in the #bloggersfestival with a lovely gilet (see post here) for a warmer look!